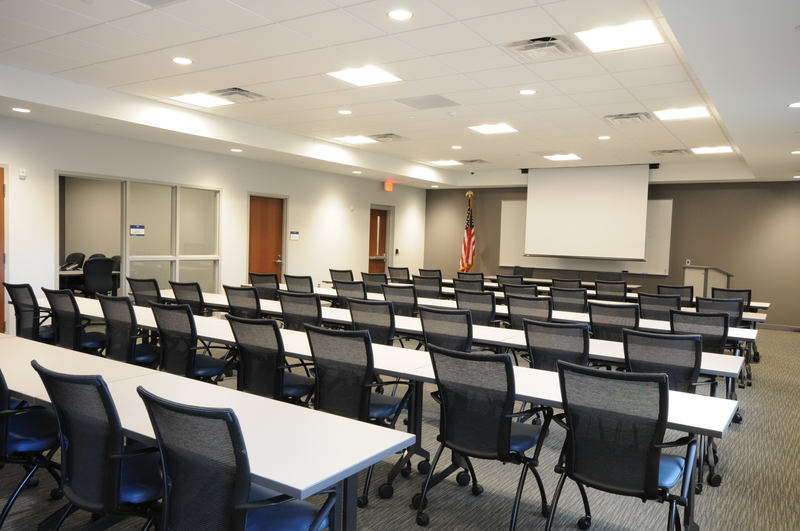 Community Rooms: Improving the Relationship Between Law Enforcement and the Community - Redstone Architects Inc. Although it might seem like law enforcement departments have been around since the very beginning of our country, colonial America had very primitive police forces, if they had them at all. In the early 1700s, big cities like Boston were the most likely to have police, and these police officers usually functioned as night watchmen, to protect the community from drunken violence and to stop prostitution or gambling. These early policemen were not very well-organized and usually served as volunteers. New Haven, Connecticut police station built in 1891. Photo credit to New Haven Independent. century and early 20th century when businessmen who had connections to political machines pushed for more formal police officers to break up labor strikes. Prohibition also created a need for more police officers and more formal police departments. According to Dr. Gary Potter, a professor at Eastern Kentucky University, “modern” law enforcement officers “were publicly supported and bureaucratic in form, full-time employees, not community volunteers or case-by-case fee retainers, had permanent and fixed rules and procedures, and employment as a police officers was continuous; and were accountable to a central governmental authority”. World War I also contributed to the militarization of police, as training became more formalized and “less community-service oriented”. 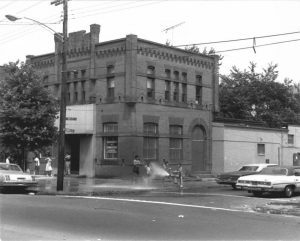 Consequently, law enforcement buildings, because of their association with government and violence, formal police buildings were often built almost like fortresses. One police station in New Haven, Connecticut, which was built in 1891, was described as a “brutalist structure” that looked “like a fortress”. 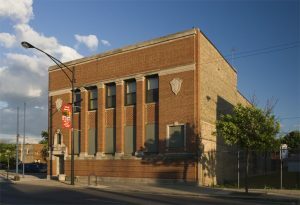 As police departments became more organized and professionalized throughout the 20th century, the need for larger buildings also contributed to the fortress-like quality of police stations, for instance the Chicago Lawn neighborhood police station, built in 1925. However, more recently, the well-publicized cases of police brutality against minorities and the resulting protests and riots like the one in Ferguson, Missouri in 2014, have led to a desire to improve the relationship between police and the communities that they serve. One way of doing this is by integrating community rooms into the design of police stations, to make police stations more inviting and more open to the community. The inclusion of a multi-purpose space in a public safety facility offers the opportunity to engage with the community it serves by making it available for various uses. It is one of the ways that helps the department involve the public and build a positive relationship with it. A community room in Marshall, MI, designed by Redstone Architects. Photo credit to Redstone Architects. the space without compromising security. For instance, the public may continue to access part of the space directly from the public lobby, while staff may access another part of the space from a secure staff area, thus allowing the simultaneous use of the space by these user groups without affecting each other. Some communities, like one in Salt Lake City, Utah, are integrating outdoor spaces as part of the community area. 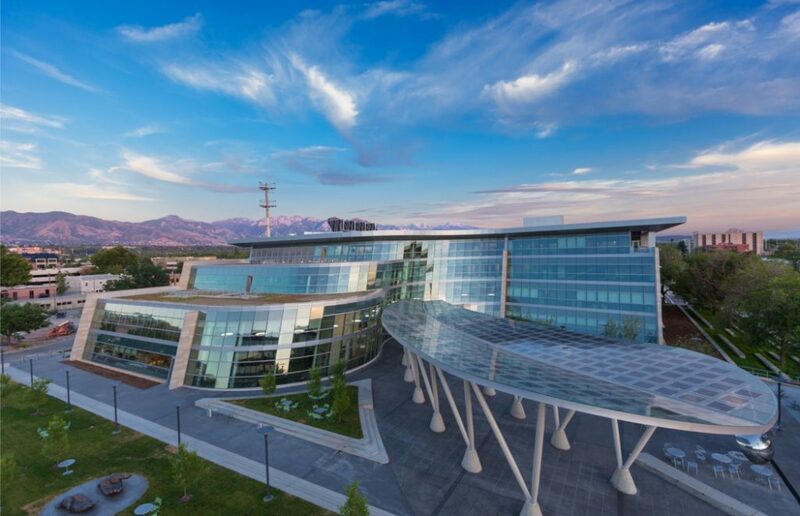 At this public safety facility in Utah, an outdoor courtyard can be used for festivals and other community gatherings. Some communities are even going as far as to design new police stations as community centers instead of just bureaucratic police stations. For instance, one Chicago station initiated the idea of free public wifi and computer labs to make police stations into useful places for the community, while at the same time building trust. On the other hand, access control should be maintained beyond the open public lobby or the community room area. 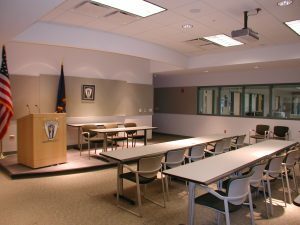 In an age where active shooters are all too common, even in police stations, bullet proof glass may be necessary for some areas of the police station. As Jim Richards explains in an article by Ronnie Garrett, “If bullet-resistant systems are designed and installed correctly, they shouldn’t be the first things you notice when you walk into the building. They should be just another component of the facility that is functional and doesn’t draw attention to itself”. 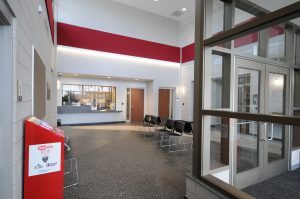 A police station lobby in Marshall, MI that is welcoming yet makes use of bulletproof glass. Photo credit to Redstone Architects. Because of this, when allowing the public into community rooms, attention must be given to prevent compromising security for the rest of the facility. Therefore, creating safe environments for the community to gather can ultimately help to improve police/community relations.